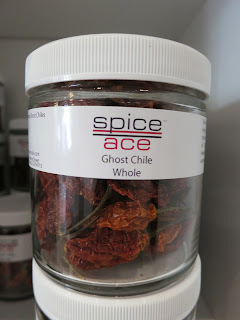 As I continue my quest to visit spice shops all around the country (and hopefully the world! ), I discovered a new one that just opened in the Lower Pacific Heights area of downtown San Francisco. Spice Ace was opened by Olivia Dillan and Ben Balzer who found inspiration while on their honeymoon in Venice. They decided to open a shop that provided mostly organic or sustainably farmed spices at reasonable prices. And one thing I can tell you is that most spice shops are not going for the "reasonably priced" marketing strategy. Inside this small store, you will find over 100 spices and herbs, over 50 peppercorns and salts, over 30 sugars and extracts, and over 30 unique spice blends. But, perhaps, the most exciting to me was their incredible selection of mild to hot peppers. From hard-to-find Chiltepin Chiles from Texas to Marash Chile Flakes, it is an impressive selection. I picked up some ghost chile powder ($8.49 for 1 ounce) and habanero chile flakes ($5.79 for .6 ounce) and I am oh so anxious to try them out. The best part is that you can taste all of the spices, salts, chiles, and sugars using their cute little spoons. Taste the difference between white truffle and black truffle sea salt and even lemon and lime sea salt.